Available to all students. Particularly recommended for those doing the four karmas fire puja or beginning Chakrasamvara practice. 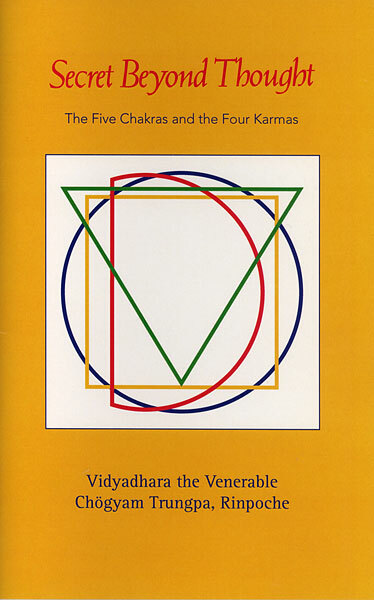 This two-disc set of remastered audio presents two talks given by Vidyadhara Chögyam Trungpa Rinpoche (Boston, February 1971) on the five chakras and the four karmas, simple but profound elements that the Vidyadhara offers as the secret hidden in the midst of everyday life. The first talk is an introduction to the tantric principles of the chakra system and how it embodies the five awakened aspects of body, speech, mind, quality, and action. In the second talk, Rinpoche offers a unique teaching on the four karmas or enlightened activities and how they can either conquer or be perverted by the four maras, our personal demons and habitual patterns of ego-fixation. 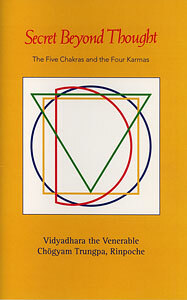 The lightly-edited talks are also available in a book, Secret Beyond Thought: The Five Chakras & Four Karmas. Click here for book.